There will be another organization occupying space on the first floor of the Prizery Building starting in October. CFED is a nonprofit organization based in Washington, DC, with offices in Durham and San Francisco. www.cfed.org. Great post! I've always liked those structures. I'm so glad they didn't get demolished by the city or by a developer. 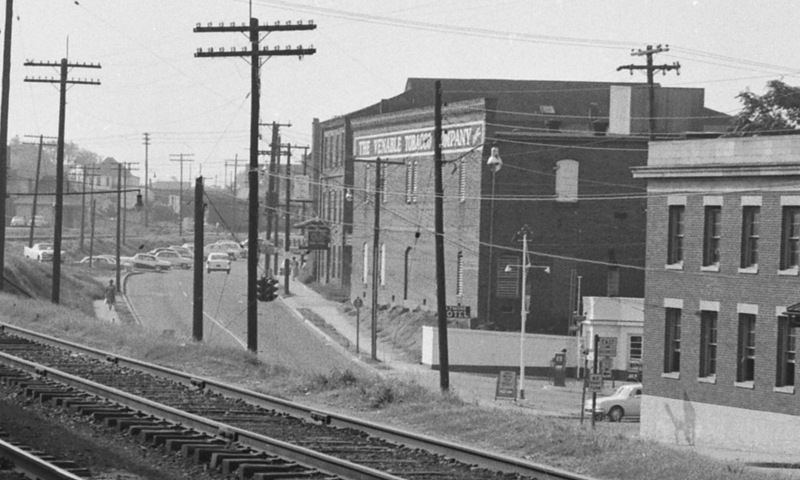 Thanks for your piece on the history of the Venable warehouse! My grandfather, a resident of Durham from 1932 until his death a few years back, became the president of Venable after many years labor that started with sweeping floors as a teenager in his native Danville. When I was a kid hanging out with him at his house on Virginia Avenue in Watts-Hillandale, he used to take us down there with him to check on things (he'd already retired), and we'd get to ride the freight elevator, poke around, and luxuriate in the smell of sweet cured leaf. Great memories, and I thank you for teaching me stuff I never knew about it. Thanks to anonymous for answering my question before I answered it. I was going to ask "Wasn't there a coffee roaster in there at some point?" I remember coming to work in the morning and enjoying the smell of roasting coffee beans. "What is it called when we repeat the same mistake over and over again, each time expecting a different result?" Gary, I believe it is called "stupidity," and our County elected officials are really good at it. I believe it's actually the definition of insanity....learned that in Celebrate Recovery...lol. Actually this is a FABULOUS post and I can't agree more with your observations! Thanks for all the info on the Venable tobacco co. I was on the internet looking this up after I purchased an antique cast iron Venable's tobacco chopper from a dealer. I wondered about the history of this old company. The chopper was likely from the counter of an old grocery store. It is beautiful, black with cast marks "chew venables tobacco" which have gold paint on the letters. It's one of my favourite pieces. My uncle by marriage, Sam Venable's daddy was Parnee Venable ( not sure if Parnee was his real name). 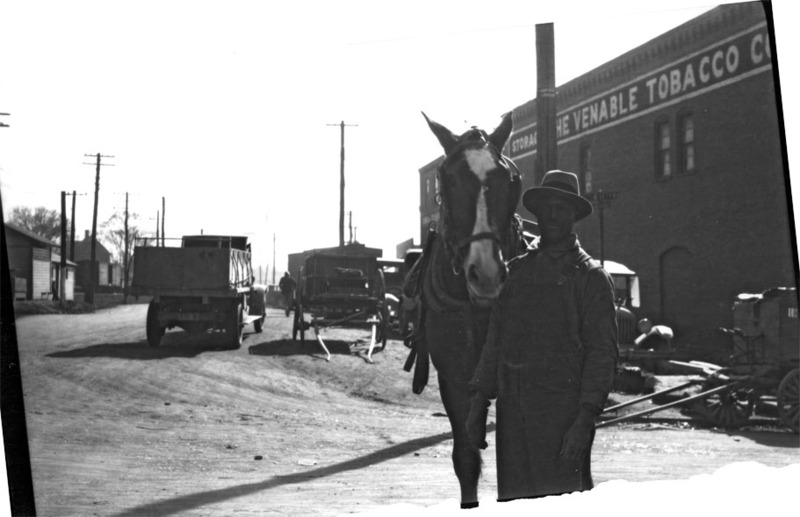 Parnee was owner of Venable Tobacco Market. Parnee lived in Wilson, NC and owned several tobacco markets there, perhaps in the 1930s. Do you have any information regarding that? Please reply. Venable Warehouse, looking east on East Pettigrew Street, likely 1920s-1930. The area immediately south of East Pettigrew St. and East of Pine St. contained a variety of buildings during the last quarter of the nineteenth century, including three prize houses that may have served adjacent tobacco factories. 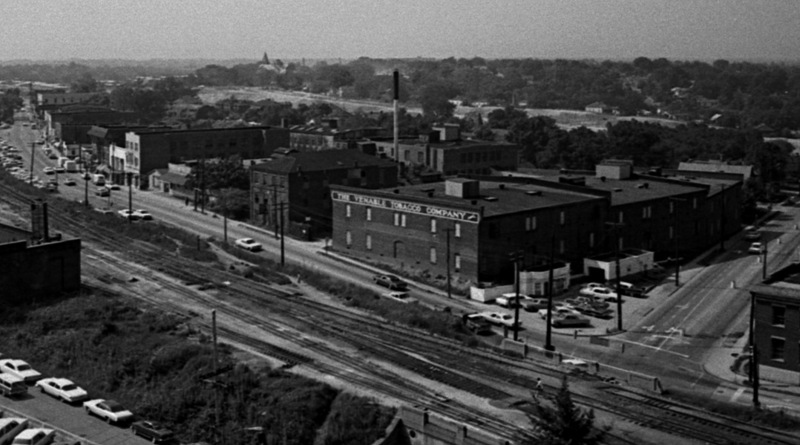 In 1905, the Durham Tobacco and Inspection Company (DTS&I), newly incorporated by the Dibrell Brothers of Virgina and a Winston-Salem based partner, Sterling Smith, built the the northern two bays of Venable Tobacco Company Warehouse on the site. 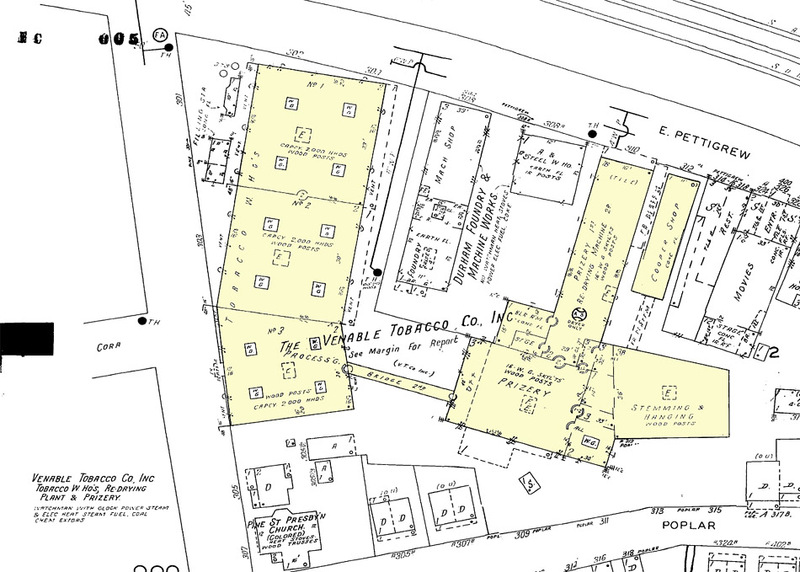 According to the Sanborn map of 1907, DTS&I leased this warehouse to its associate firm, Venable Tobacco of Virginia. An L-shape, masonry and ironclad “Dry House” were added next to the older prize house, on the site of the existing Prizery; these were also leased to Venable Tobacco. In July 1908 the Dibrell Brothers purchased a one third interest in this building from A. C. Acree. The deed transfer describes the building as a one-story brick and metal-clad “prizery” at the rear of the site belonging to DTS&I. It contained an engine and boiler drying apparatus, power screw, shafting and belting, and other equipment. It is apparently this same building that was jointly sold three months later by Dibrell Brothers and J. E. and Lizzie Perkinson to DTS&I. On the 1913 Sanborn map - the same map that shows the construction of the third, southern bay of the Venable warehouse – the “Dry House” has been expanded with additional iron- clad construction to form “Prizery no. 1.” The old prize house had either been incorporated into the expanded building or had been destroyed. The apparent present 'curve' of the warehouse, away from Pine Street/South Roxboro at the northern end, results from the fact that the warehouses originally followed the curve of Pine Street, which curved east to meet the railroad/Pettigrew St. at a 90 degree angle. The street was moved to the west to align with Roxboro St. when the railroad crossing was created. In July 1922 a new Venable Tobacco Company was incorporated under the laws of North Carolina. The firm was directed and owned by individuals from families prominent in the Durham tobacco industry: Clinton W. Toms, Jr., James S. Cobb, and his son J. O. Cobb. The Dibrell Brothers, however, retained a major interest in the firm. The same month the property of Venable Tobacco Company was surveyed and filed with the Register of Deeds. One month later the North Carolina company purchased the prizery and redrying plant from the Virginia- based Venable Tobacco Co., as described in a deed transfer dated August 22, 1922. Two years later it purchased the warehouse from Durham Tobacco Storage and Inspection Company. The transfer of the prizery and redrying buildings to Venable Tobacco-NC suggests the company's intention to expand these facilities. Redrying machinery - notably the Mayo dryer - came into use in the first decade of the century; between the boom years of 1916 and 1929, many companies enlarged their redrying and storage facilities. Redrying plants required expensive equipment, including engines, boilers, and prizing apparatus, as well as specialized and unskilled labor. The high initial investment and fixed costs of these operations meant that only larger firms could afford them. This resulted in the consolidation of brokerage firms - which may explain the reorganization of Dibrell Brothers' North Carolina interests and the Venable Company around this date. date circa 1930. A large, two-story metal-clad redrying plant and a building for stemming and hanging appear to have been built at the same time as the new prizery. The enlarged complex indicates a dramatically expanded capacity for the company. The still-extant prizery is one surviving example in Durham of a building type that was essential in the commerce of bright leaf tobacco. Prizeries or "prize houses" began to proliferate after the Civil War, as bright leaf tobacco replaced the older dark leaf variety. Because there were few local markets in North Carolina, dark leaf tobacco had to be transported over long distances to Virginia markets. Growers sorted their leaves simply, according to size, and pressed or “prized” them in part to make transportation more manageable. With the introduction of bright leaf tobacco grading became more complicated, and growers were encouraged to bring their tobacco “loose” – unsorted and ungraded - to local auctions. Tobacco brokers bought green, bright leaf tobacco at the famous "loose leaf auctions", held at local sales warehouses. They transferred their purchases to prize houses, which they often owned and which often had attached redrying facilities. Here the tobacco was sorted and redried in redrying machines, taken off the sticks, and "prized" or pressed into hogsheads. It was then transferred to a warehouse where it would be aged until ready for shipment to manufacturers. Looking northeast at the Venable Complex, circa 1950. In 1952, a one-story Receiving Room was added to the south facade of the Prizery. The need for added capacity suggests increased demand from markets opened up after World War II. The location of the addition allowed access from Poplar Street via service doors on the east and west facades. Loading facilities that were oriented toward the road, rather than the railway, suggest the shift that had occurred by this date in the transport of tobacco. Venable Warehouse from the platform of Union Station, looking east, 02.19.62. In 1969, the stemming and hanging building, redrying building, and cooper shop were destroyed by an immense fire. Looking south from the railroad tracks, 05.07.69. Looking east past the Receiving Room, 05.07.69. Fire in the redrying building and Cooper Shop, looking south from East Pettigrew, 05.07.69. Not sure if this is bringing the fire in the Redrying Building under control or trying to prevent fire (and failing, as seen further above.) 05.07.69. After the fire, and tobacco had to be shipped to Danville for redrying. In the early 1970’s, Venable Tobacco merged with several Dibrell Brothers companies, taking the name of one of these, C. W. Walters. The complex continued to function as a tobacco facility until the early 1980's. At that date the prizery was purchased by West Brothers Trucking Company, which partitioned the interior for use as office spaces. The prizery operated as the Venable Business Center, providing tenant space for a number of commercial tenants and artists, as well as a coffee roaster. The warehouse building was used by a variety of tenants as well, most notably a number of construction/architectural salvage businesses, beginning with the Summer Beam and the Building Recycling Center, and later by Peters' Design Works. Scientific Properties began construction on the warehouse building in mid 2007, and completed shell construction by December 2007. The building currently houses two city departments: the Office of Economic and Workforce Development, and the Equal Opportunity, Equity Assurance Department. The company advertises the development as providing "Class A office, lab and retail space." I'm not a fan of the copious surface parking along the East Pettigrew St. frontage, however, the configuration of the historic buildings at the west and south edges of the property make the provision of parking in another form problematic. There's not much space to build a deck with a wrapper, and do you block the view of the Prizery Building from E. Pettigrew to get it done? I hope that a future provision of public art along the Pettigrew Street frontage, and overall future redistribution of parking in the 'southeast downtown' landscape will allow for a stronger street presence heading east from the Warehouse building. And while I would also have liked to have seen a return to sash windows on the warehouse, I'm otherwise a fan of the exterior and interior renovations, which include a large skylighted stairwell between bays of the warehouse building. Having spent quite a bit of time in the receiving room space prior to renovation for Sommerhill, I'm most impressed with that transformation. Because really, the receiving room, a 1952 cinderblock building, doesn't seem like it would have much business being beautiful. But the combination of the entryway, the gallery interior, skylights, and 'glassed-out' garden in the center of the space are impressive. Since I've given grief to Phil Szostak in the past for the design of the Performing Arts Center (it has grown on me, unlike the bus station) it's incumbent upon me to note that he designed this space. Moving forward, I hope the Venable renovation serves as an anchor for redevelopment of the many acres of Hendrickland to the southeast. There's the opportunity to create a strong gateway here to connect development near the ballpark and American Tobacco to the Ramseur Street corridor (the former 305 South,) Cleveland-Holloway, Edgemont, Golden Belt, and the portion of Fayetteville Street across the freeway. That will require developers and government alike to begin thinking of these spaces as vibrant pedestrian corridors, through which boulevards like Mangum, Roxboro, and Fayetteville run. The acquiescence to a highway landscape, as the county seems intent on doing throughout the eastern half of downtown, will - surprise - perpetuate it. The opportunity to link the new economic viability of spaces like Venable to 'North-East-Central Durham' exists in filling in the empty spaces and allowing the economic growth to encourage entrepreneurs to revitalize the fallow historic structures. Unfortunately, the county will backhoe away those opportunities in the 500 block of East Main Street for a giant, giant surface parking lot (a request for demolition bids for these two blocks - bounded by East Main, Ramseur, Dillard, and South Elizabeth has been issued as of two weeks ago.) Why we continue to destroy historic structures - the sole vehicle for the revitalization of downtown Durham - and somehow believe that doing so will make Durham a better place remains utterly beyond my comprehension. What is it called when we repeat the same mistake over and over again, each time expecting a different result?